Over the years, your roof will start to show signs of wear and tear. Timely maintenance can help you in avoiding the cost of repairing a damaged roof. 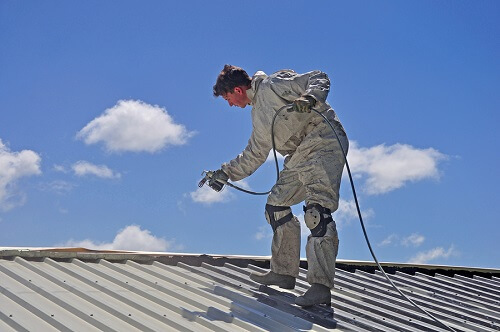 One such method is roof spraying. It involves repainting and sealing which is used to prevent leaks in your roof. This job requires professional expertise, and a thorough understanding of the work involved. A leaky roof is potentially dangerous. Water can get into the electrical system, damage the interior, and even undermine foundations in serious cases. A good spray job will protect your roof for many years. Safety is a serious issue: OHS and safety rules in the roofing industry are very strict. Any professional roofer or builder will tell you that working on a roof can be extremely dangerous. Even on a low roof, injuries from falls can be horrific. A moment of inattention or distraction can lead to a real horror story. You must have the right safety equipment: You will require proper harnesses attached to safe anchor points, and good dependable non-slip footwear. You should also have a good, stable extension ladder and choose safe access points, both to and from the roof. Can the roof bear your weight? If a roof seems to move when any weight is put on it, this is cause for alarm. The usual causes of roof movement are old timbers, or dislodged, unstable supports. A moving roof is likely to be in very bad structural condition. If you are in any doubt whatsoever about the roof structure, do NOT set foot on the roof. Roof restoration and/or other roof repairs will definitely be required before you can spray the roof. Don’t work alone! All professional roofers work with at least one other person. This is done as a safety precaution, to ensure that help is immediately available if someone working on the roof gets in trouble. Technical issues of roof spraying: The right choice of spray and thorough spraying are the keys to success. Please be aware that to be fully effective, roof spraying must be done systematically and done well. Even minor gaps in spraying can cause problems. Safe spraying: Due to the use of harsh chemicals when roof spraying, it is extremely important to follow safety directions. If you’re spraying your own roof, make sure you take all safety measures. These include but are not limited to wearing appropriate clothing and footwear, safety goggles, masks and first aid instructions on the products. Professional roofers are licensed tradespeople that possess the right qualifications and years of experience. Even the truly expert DIY people are at a real disadvantage when spraying roofs. This simply isn’t the sort of job you can learn overnight. You can do a lot of hard work spraying your roof, and find that there are still problems with leaks and sealing issues. It really is better to leave it to the professionals. ReKote Roofing and Restorations are your do-everything roofing contractors for roofing in Wollongong and Sutherland. We can do any roof spraying job and other types of roof restoration for you, including roof painting. To find out more about our services, call your local Re-Kote service on the numbers below, or complete our online form.